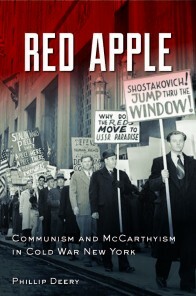 Phillip Deery, Red Apple: Communism and McCarthyism in Cold War New York (New York: Fordham University Press, 2014). From the late 1940s through the 1950s, McCarthyism disfigured the American political landscape. Under the altar of anticommunism, domestic Cold War crusaders undermined civil liberties, curtailed equality before the law, and tarnished the ideals of American democracy. In order to preserve freedom, they jettisoned some of its tenets. Congressional committees worked in tandem, although not necessarily in collusion, with the FBI, law firms, university administrations, publishing houses, television networks, movie studios, and a legion of government agencies at the federal, state, and local levels to target “subversive” individuals. Exploring the human consequences of the widespread paranoia that gripped a nation, Red Apple presents the international and domestic context for the experiences of these individuals: the House Un-American Activities Committee, hearings of the Joint Anti-Fascist Refugee Committee, resulting in the incarceration of its chairman, Dr. Edward Barsky, and its executive board; the academic freedom cases of two New York University professors, Lyman Bradley and Edwin Burgum, culminating in their dismissal from the university; the blacklisting of the communist writer Howard Fast and his defection from American communism; the visit of an anguished Dimitri Shostakovich to New York in the spring of 1949; and the attempts by O. John Rogge, the Committee’s lawyer, to find a “third way” in the quest for peace, which led detractors to question which side he was on. Examining real-life experiences at the “ground level,” Deery explores how these six individuals experienced, responded to, and suffered from one of the most savage assaults on civil liberties in American history. Their collective stories illuminate the personal costs of holding dissident political beliefs in the face of intolerance and moral panic that is as relevant today as it was seventy years ago. (Source of text and further information: http://www.oup.com.au/titles/higher_ed/social_science/politics/9780823253685). John Tully, Silvertown: The Lost Story of a Strike that Shook London and Helped Launch the Modern Labor Movement (New York: Monthly Review Press and London: Lawrence & Wishart, 2014). Preface by John Callow, Head of Research, General, Municipal, Boilermakers and Allied Trade Union, and John Marriott, Emeritus Professor of History, University of East London and author of Beyond the Tower: A History of East London. In 1889, Samuel Winkworth Silver’s rubber and electrical factory was the site of a massive worker revolt that upended the London industrial district which bore his name: Silvertown. Once referred to as the “Abyss” by Jack London, Silvertown was notorious for oppressive working conditions and the relentless grind of production suffered by its largely unorganized, unskilled workers. These workers, fed-up with their lot and long ignored by traditional craft unions, aligned themselves with the socialist-led “New Unionism” movement. Their ensuing strike paralyzed Silvertown for three months. The strike leaders –including Tom Mann, Ben Tillett, Eleanor Marx, and Will Thorne—and many workers viewed the trade union struggle as part of a bigger fight for a “co-operative commonwealth.” With this goal in mind, they shut down Silvertown and, in the process, helped to launch a more radical, modern labor movement. Stuart Macintyre is a Professor of History at the University of Melbourne, Phil Deery is a Professor of History at Victoria University, and John Tully is a Senior Lecturer in Politics and History at Victoria University.